Despite having just eaten at Koya and having a reservation at The Ledbury (review coming soon) just hours away I couldn’t possibly not eat at Yoobi when I realised how close it was. 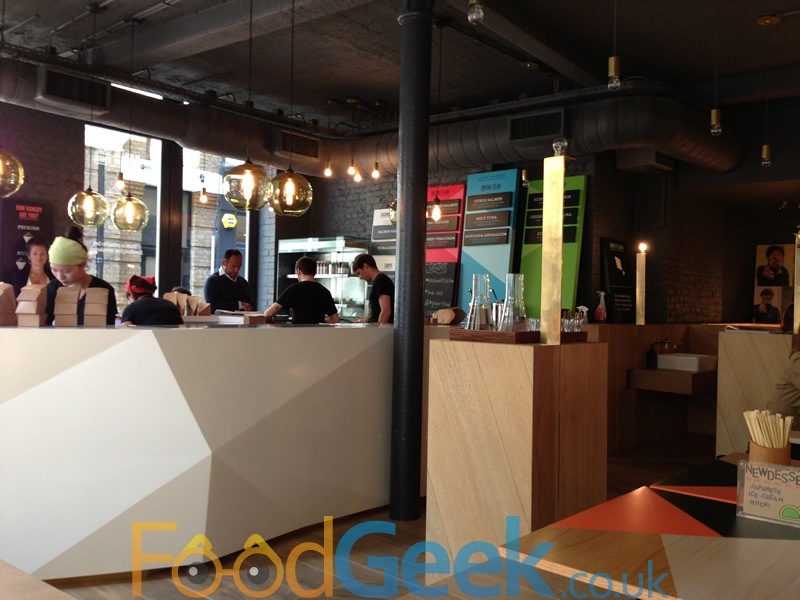 Yoobi is London’s first ‘temakeria’, but what is a temakeria I hear you ask? It’s derived from the word temaki which is a type of sushi that is wrapped in a nori (seaweed) cone. It’s traditionally street food in Japan but has become huge in Brazil thanks to the Japanese immigrant community and ‘temakerias’ are the restaurants in which they’re served. First impressions upon entering the restaurant in Soho’s Lexington Street were good, although it has a minimal vibe it’s much more Brazilian than Japanese with it’s bright colours and fiesta music playing. 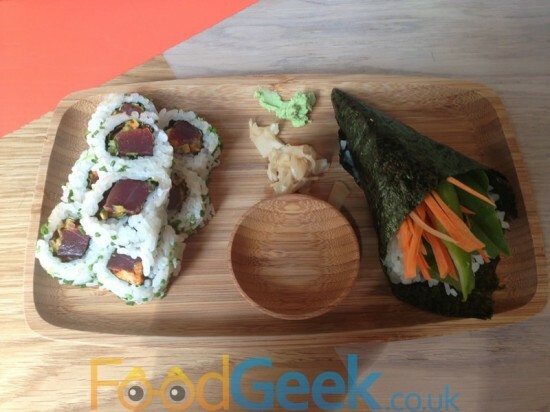 Being a temakeria they primarily serve temaki handrolls, in 9 different varieties although they are all available as maki rolls instead and they also offer salmon & tuna sashmi boxes. Still being full of noodles I couldn’t eat much but did want to at least try a temaki and a portin of maki rolls. I went for ‘Avocado & Asparagus Temaki’ and ‘Spicy Tuna Maki Rolls’. Orders are placed at the counter in the centre of the room where you can wait and watch the chef prepare the sushi freshly or you can take a seat and wait for your order to be called. My order was ready quickly, no more than 10 minutes, served on a lovely wooden tray. The temaki was perfectly formed, as well as avocado & asparagus it also contained spinach, carrots, white miso sauce and of course rice. It was bigger than I expected but still easy to eat by hand, I can see why they’re popular as street food in Japan. It tasted absolutely gorgeous too! The maki rolls were not quite as well formed, I suspect that the staff are not properly trained sushi masters but at these prices that’s to be expected. Not a major problem, just the rice was a little loose but they were perfectly edible and the ingredients seemed high quality. Flavour wise it was also delicious containing tuna, romaine lettuce, croutons, rice and a spicy sauce. The croutons in particular were a nice touch adding an interesting crunchy texture which i’ve never seen with sushi before. 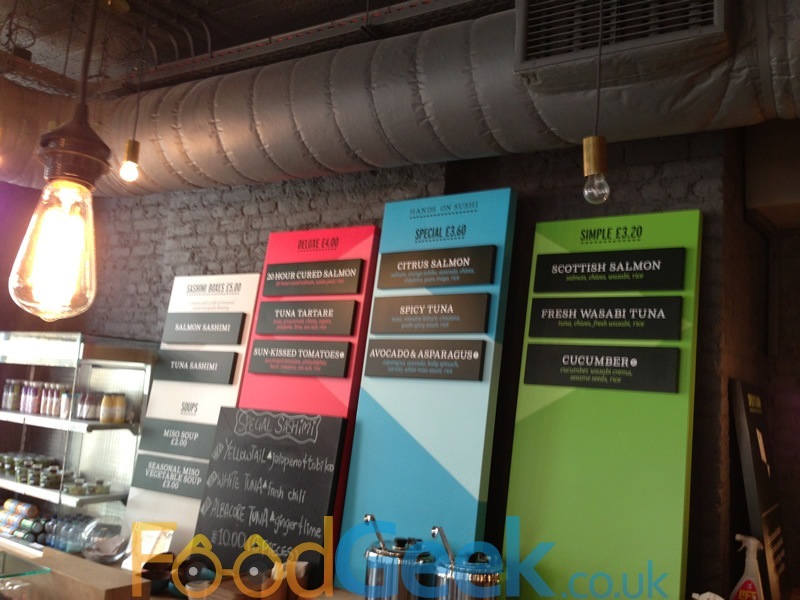 They also offer a great range of fresh juices, teas and healthy fresh fruit ice creams. I really enjoyed Yoobi, it’s cheap, it’s fast, it has a great vibe, the food is much higher standard than I expected and I just love the concept. I hope that they continue to grow and dream of one opening in Manchester someday. Previous: Koya Japanese Udon Restaurant, London – The Slurpiest Noodles In Town!